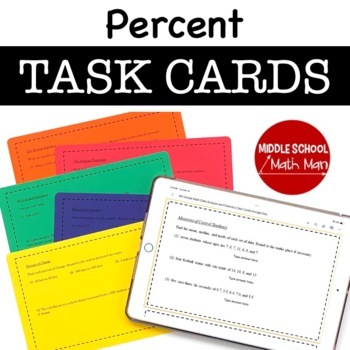 This resource includes eight 7th grade math task cards. Each task card includes 3-4 math problems for each of the following topics related to percents (29 total problems). An answer key IS included! Each page has two copies of the problems for that topic, making it easy to print, copy, and cut into half pieces of paper for students to use. Problems are not meant to be a lesson in itself, but can be used in lots of different ways. Great to use in math centers with students, as problems for students who are finished with work, or as exit slips. These problems are intended for use in 7th grade. 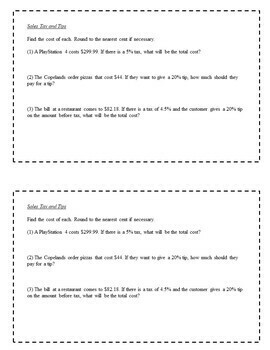 For 6th and 8th grade math task cards, be sure to check out the following bundles!